Did you know 95 percent of folks do not have a fully vested trust in place that will keep their estate out of probate once they have passed? By the way, a lot of folk's estates go through probate. Famous people like Michael Jackson and Steve Jobs estates have gone through probate. Although I am not an attorney, I work with many probate attorneys and these statistics are real. The basic answer is, probate is the court process required to distribute someone's assets when the loved one has passed without a trust. The probate courts are the ones that have to figure out who will get these assets and how they should be distributed. There are different types of probate, so working with someone that understands the process is best. What makes a certified probate real estate specialist different from a regular real estate professional? A certified probate real estate specialist has been trained in the probate process, they understand timelines, they work with the courts, attorneys, and personal representatives to make the process easier and sell the properties for top dollar. At some point within the Probate process, if you have real property within a probate, you will need a Probate Comparable Market Analysis (PCMA) which will advise the courts and attorneys what the properties are worth at the time of death. Then another PCMA will most likely be needed at the time of the listing of the properties, which could be months or years later, during which the values could change. Here are a couple myths about probate. A power of attorney will keep me out of probate. This is incorrect, if you have a power of attorney while someone is alive, this will allow you to make decisions for that love one, but once they have passed, the trust will take over, so if you do not have a trust in place, you will go through probate. If someone has a will without a trust, they will be safe from probate. Most likely not, they will have to go through some sort of probate because the will is just the written instruction. Because there are written instructions, it will help the probate courts know what your loved ones wanted. Certified probate real estate specialists help families that are going through the probate process with real property. They help facilitate a home's clean-up, decide with the families what to fix within the home, market the properties for sale, and sell them for top dollar. 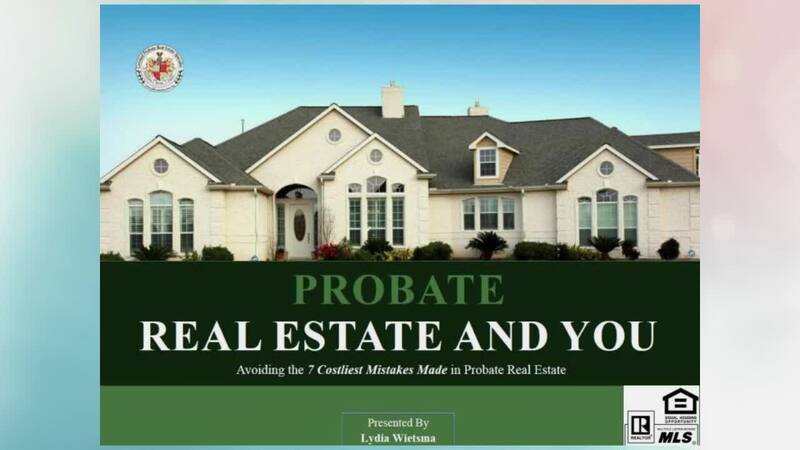 For more information, download the free e-book, The 7 Biggest Mistakes Most Administrators and Executors Make While Going through Probate and How to Avoid Them at www.probaterealtyhelp.com/kit102 . I'm a certified probate real estate specialist with a passion for helping families in need during probate. For more information and a free, 30-minute consultation, give me a call at 602-910-6271, or email Lydia@ArizonaPowerAgent.com. Visit www.ProbateRealtyHelp.com . **It is always advised to talk to a probate attorney within your own state about your own situation.